Apostolic Titbits: Happy In-dependence In God! We as a nation are celebrating our 66th Independence day. The notable thing about it personally is that my mother and India has the same years of existence. Jesus has always been good to me in my life. He gave me a tremendous burden for our nation and I have been praying for it ever since. My father and mother too have been having a great burden for it in their lives too which I believe has been transferred to me. Right from my childhood days I have seen my dad having two maps in his room stuck to the wall to pray. One is a world map, other is a India map. As I have grown up in this nation, I have been truly amazed by its great diversity. As my dad and mom have been missionaries with a heart of a pilgrimage, we have always loved to meet new people who are different from us. India has a great blend of varities. You can see the most educated, rich, middle class, cultured and business people in the cities of India. But once you cross the cityline boundary, you can see peasants, rich land lords and a totally different culture altogether. My dad pioneered a Church and have been pastoring ever since in a small city named as Erode in South India and then have gone on to all the villages around to start other small Churches for the village people. I have always enjoyed the poor people from villages around who have great faith though uneducated and also the educated people equally alike. They have all sincerely prayed for me and our family till date. Today I am what I am because of all the prayers of sincere saints who have prayed for me right from my childhood days. As I look backward to my childhood days I vividly remember, how our nation of India has come up economically, culturally, scientifically, socially and industrially to be what it is today. It is all the grace of God that we are once again according to the end time prediction of the Bible, we are rising up to be one among the "kings from the east" (Rev 16:12). The number six signifies working. In the sixth day God created man, it was the last day that God spent doing His Work and finished His work to completion, and it is the time we are likewise told to work! 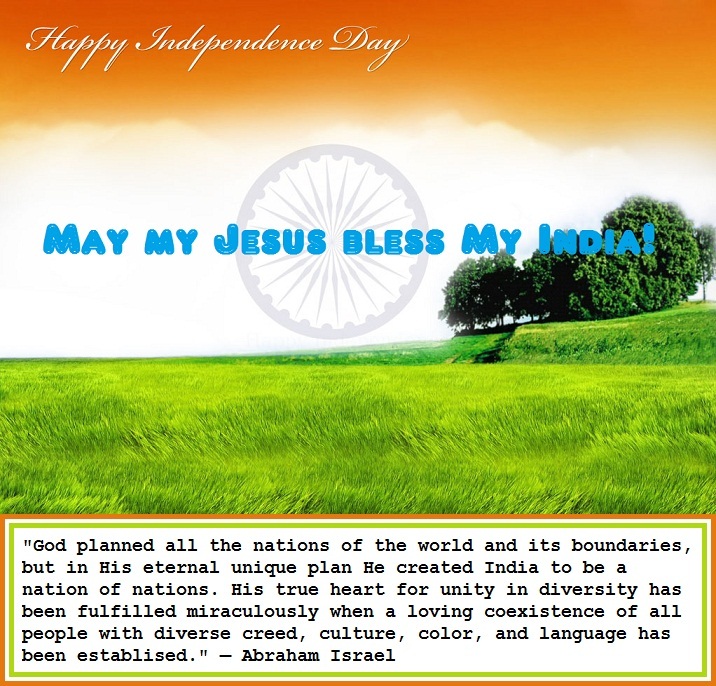 So on this special day of our 66th Independance, My prayer for all Indians in the whole wide world especially and those saints of all nations who love India is, "My dear Jesus, bless our nations and thank you for setting its boundary and preserving it for all these years. Thank you for all the soldiers and families who have died to defend its freedom and preserve its great cultural heriatage and divergence. We praise you for the Lord Jesus who has died to give freedom and liberty to us so that we could now live free from sin. As this is a time to work hard physically and spiritually rest in your finished work of Jesus who died for all of our humanities sins, strengthen and help all our country men receive the unconditional love of your heart in order to live in your supernatural peace, joy and righteousness and be saved from sin through receiving your only begotten Son Jesus Christ as their one and only Lord and Saviour of their lives. Bring prosperity spiritually, soulishly, physically, financially and socially to all the Indian and the saints of the Church in all the world of all nations. May this nation of India bring smile to your face and lift your name as its only source of existence. May India become a blessing to the whole world in the coming days. Thank you for thinking about India two thousand years ago itself and sending Apostle Thomas to preach the gospel so that we might receive true salvation in this land. We thank you, bless you and help us all glorify you as a nation together. In Jesus wonderful name I pray...Amen!!!" "And having been set free from sin, you became slaves of righteousness." (Rom 6:18).